A building which is believed to be the only structure to have survived the Great Fire of London on the Strand has been damaged after a bus crashed into it. The Wig and Pen, which survived the 1666 fire and the Blitz, was hit by a number 341 bus on Thursday morning. 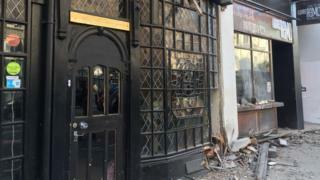 Owners of a restaurant which is housed in the listed building said parts of it were "completely" damaged. Transport for London (TfL) said it was investigating. The historic stained glass windows of the building - which has stood since 1625 - were also smashed in the accident, which happened at 04:00 BST. Originally built as the home of the gatekeeper of Temple Bar, the Wig and Pen is said to be the only structure in the Strand to survive the Great Fire. It was later used as a meeting place for journalists and lawyers. It has housed the Thai Square restaurant since 2003. The restaurant has been closed since the crash and its owners fear it will be shut for three months. Restaurant owner Haim Danous said: "Some of the staff live upstairs, so they had a bit of a shock when the bus crashed at 04:00. "But I am just focused on restoring the building now and it will hopefully be done in about three months. "The building has so much history, it's a shame this has happened. It survived the Great Fire of London but not a modern London bus." A TfL spokesman said: "The incident took place in the early hours of the morning. The road was reopened not long after 05:00. There were no injuries and the operator is investigating the incident." The Great Fire raged for four days, destroying most of the city, which was then largely built of wood. More than 13,000 homes, businesses and structures, including the old St Paul's Cathedral, were destroyed.